Missouri State went 12 of 14 from the line and 7 of 18 on 3s. 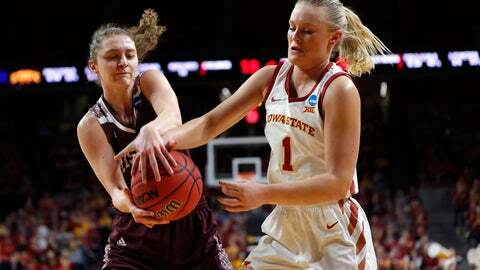 The Lady Bears entered play at just 33.6 percent from beyond the arc. … Missouri State forced 13 turnovers and led for over 36 minutes. … Iowa State got field goals from just four players: Carleton, Ashley Joens and Alexa Middleton (9 points) and Kristin Scott (8). Carleton, the Big 12 Player of the Year, was 10-of-16 shooting. Her teammates went 11 of 43. … The Lady Bears got 20 points from their bench. All the Cyclones got from their reserves was one free throw by Ines Nezerwa. “A lot of frustration and disappointment that we didn’t play the game the way we wanted to play,” Middleton said.